Everytime I think about having my own home my mind jumps straight to the huge kitchen we'll definitely aim for. My boyfriend and I both love to cook and long to have more space to have gadgets in our kitchen. Of course there are things all bakers dream of (kitchenaid mixer I'm looking at you) but something I've never thought of before was a Bread Maker before Panosonic got in touch. My dad bakes fresh bread regularly at home but it is a skill I've never learned - I have to much of a sweet tooth. There are so many different programs in this Bread Maker it is difficult not to be impressed. I could easily see myself whipping up a batch every few weeks if I had one of these in my kitchen. You can even make jam in it so what's not to love? Another appliance I'm dying to get my hands on is a food processor. My mum uses her all the time and since I've inherited hers love of cooking I'm sure I will to. She makes delicious pizza dough in it but it also comes in handy for time saving. 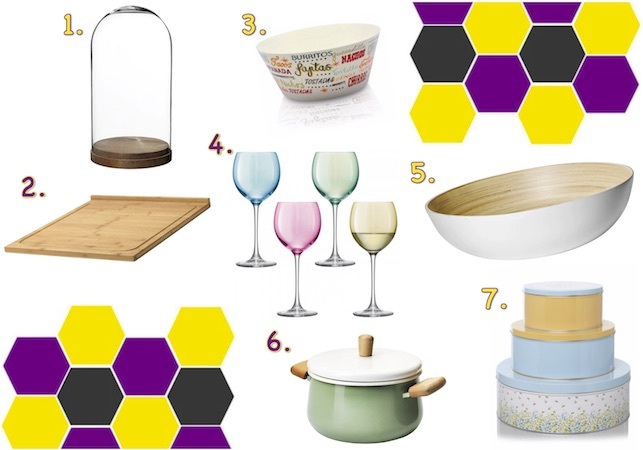 Lastly I'd like to finish this post with a little wishlist - because what would a kitchen be without accessories. Most of these are from Ikea because it is a mecca for kitchen supplies. I can see things being beautifully displayed in this glass dome, a big chopping board that will stay stable on the worktop is a must, this super cute green pot will match a few items in my wardrobe... and I love this bamboo bowl for fruit or serving at a dinner party. Another place I seriously rate for homeware is George at Asda. I love the Mexican food maes on this bowl and since my boyfriend and I eat a lot of Mexican this would definitely fit in. These cake tins are in lovely spring/summer colours... any excuse to bake cakes to fill them. Last but not least are these gorgeous LSA wine glasses. My flatmate has pink ombre ones already but I'd love to get my own when I move out. They don't do ombre ones anymore but I love these colourful pastel ones. Do you have a Bread Maker in your kitchen? What kitchen gadgets are on your wish list? and cooking is all my own.